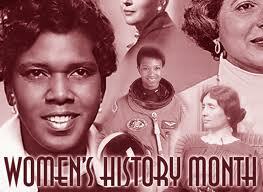 Women’s History Month is celebrated annually during March and highlights the contributions of women to events in history and contemporary society. So I want to dedicate this blog post to the ladies! I want to thank Harriet Tubman, Ida B. Wells, Rosa Parks, Angela Davis and all of the women who were courageous enough to fight for our rights in the past. I want to thank Michelle Obama, Maya Angelou and Oprah Winfrey who are upholding a positive image of women today. And of course, I want to thank the everyday woman…my mother, sister, aunt, friends, community figures, and other ladies who exude confidence and strength. Women are strong. Women will work more than one job, attend school, cook, clean, bear the children, take care of her man, take care of the children, workout, support her friends, and STILL look good in the process! Go Girl! Women are strong. Women are forgiving, nurturing and thoughtful. Women will smile and laugh when they feel like crying instead. Women will give you their best. Go Girl! Women are strong. Women are fighters. Just when we feel like throwing in the towel, we’ll try harder instead. Women will make a way out of NO way. Go Girl! There are so many pieces to a woman. But our complex personality is what makes us Beautiful! Women, I urge you to excel at work. Demand respect. Don’t settle. Don’t hold grudges. Forgive. Love. Move on. Hold on. Don’t give up. Try harder. Know when to let go. Be a better mother. Be a better friend. Be a better wife. Be a better woman. Become a mentor. Give back. Get involved in your community. Speak up. Continue to shine. Continue to stay strong. Always SMILE. You ARE a SUPERWOMAN! You are BEAUTIFUL! Tell the next woman you see that she is, too, beautiful! History is EVERYDAY! So ladies, LET’S MAKE OUR MARK ON THIS WORLD! Go Girl! Feel free to leave your thoughts. Shout out the ladies who are making a difference in your life!